from 158,80 EUR* Not ready for shipping. Reserve today and we will ship as soon as possible. from 161,35 EUR* Not ready for shipping. Reserve today and we will ship as soon as possible. The synthetic cast dressing is similar to the better known plaster cast. Cast dressings are activated by water and are very easy to model with very little mess. They are light and are permeable to water vapour and air. Most cast dressings are fully resilient within 20 minutes of application, so they can also be quickly applied to animals that have not been sedated. Vets use cast dressings as immobilising or supporting bandages, for instance with fractures, or to make orthopaedic splints. In this case, the cast dressing is applied as normal. Once it is hard, it is sawn vertically into two pieces. Both halves can then be attached to the extremity with an adhesive bandage. 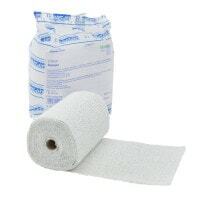 Cast dressing splints allow quick bandage changes and ensure the extremity is held firmly. However, plaster casts are still used in veterinary medicine. 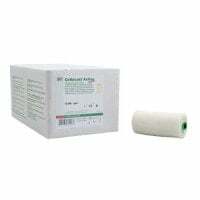 They are very affordable and are also highly suitable as plaster splints thanks to their good moulding qualities. 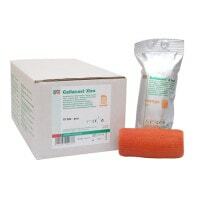 In the plaster casts and cast dressings category, Praxisdienst-VET offers different types of casts from the Hartmann Company and BSN medical, as well as plaster bandages. Purchase the dressings you need conveniently and at affordable prices from the online shop at Praxisdienst-VET.de!